After almost ten months of travel, we are happy to come to my home country of Colombia. I am extremely happy to finally be in many places I haven’t been in Colombia and visit my family. It’s nice to see familiar faces after such a long time of travel. We decided to start at the bottom of the country with Cali. This city is the capital of the Colombian salsa, city of many typical dishes like Sancocho de gallina (hen soup), almojabanas y pandebono. Cali is the city known as forever spring, since the weather always feels as spring or hotter. My aunt and her daughter and family live in this beautiful city of 3 million inhabitants. We took a bus ride from Quito directly to Cali, it was a 23 hour bus ride and hopefully our last really really long ride. We will be taking buses to visit Colombia but all of the rides are no more than 9 hours. As we arrived to this city, we felt welcomed right away. The people in Colombia are very warm, funny and friendly. One of my cousins, Andres, came to pick us up and took us to a typical local day trip to Rio Pance. There we could hike, ride bicycle or like everyone else enjoy the cold water of this river. On spot, we also ate a good Sancocho de Gallina (Hen soup) along witth a cold local beer. It was beautiful to see all of the flora that grows around this place, from huge bamboos to beautiful flowers. Birds of all types were also flying around us. It was a beautiful start of our trip in Colombia. In the evening, we wanted to go to Tin Tin Deo Club, a famous spot for locals and foreigners to come and dance salsa, or see people dancing. Unfortunately, one of us was sick and we were unable to go, but it’s a good reason to come back and visit Cali. The next day we spent it with the whole family, enjoying a delicious ajiaco (another type of hen soup) made by my cousin Alicia, talking, catching up and relaxing at their beautiful house. On Monday, we went to visit the city center, starting by one of the first and famous neighborhoods of Cali, San Antonio. This small little neighborhood is located on a hill with a amazing view of the city. 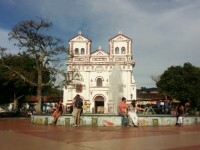 The church at the top is colonial style decorated and has a park in front for a relaxing afternoon for the locals. As you head down the streets, all of the homes are also colonial style and painted in different and bright colors, giving an unique contrast and making each home its own piece of art. Walking a bit more, passing the famous main Calle 5th, is the actual city center where tall office buildings stand. A little chaotic because of the crowd but nice to see until you get to the Cali river. This is the main river of the city and divides the city between the north and south. Along the river, you’ll find the famous cats of Cali. The story goes when a local artist and sculptor, Hernando Tejada, donated a piece of art of a male cat to the city. The local government decided to decorate the park by placing this sculpture along the river and create a park around it. After 10 years, the government thought the male cat sculpture was too alone so they called locals artists to create 15 female cats to accompany the lonely male cat. Each artist decorated the cat to its style and they were placed in different spots along the river, calling it “Las gatas del gato” (The female cats of the male cat). It’s a relaxing and joyful walk spotting all of the female cats and the story behind the artists. There is also an astonishing white church, La Ermita, at the end of the park of Las Gatas. After, we walked to Empanaditas del Obelisco to enjoy the unique empanadas and a cold beer to end our day the best way, with great food. In of it all, Cali is a beautiful city, full of history, warm weather, great people and even better food. Thank you to my family for such a warm welcome and hospitality. Our next destination has been a small town called Montenegro and where a closed friend lives. Myriam opened her doors to us and welcomed us with all of the love into her home. Montenegro is a great location to visit the coffee zone as it’s located in the middle of it all. Our first trip would be Santa Rosa de Cabal. This small coffee grower town is known for its thermal baths. Natural hot springs coming from 12 km underneath the ground. A beautiful natural waterfall and 4 pools of 40 degrees Celsius water. The park welcomes many tourists every year. There is also a 4 stars hotel nearby with a hot springs of its own making it unique in the area. The scenery around is breathtaking, birds everywhere and beautiful decorated facilities. There is a 2 hour walking tour showing where the hot springs come from and all of the flora and fauna around the area. A must do walk while visiting the hot springs. The next day, we went to visit the nationally known theme park called Parque del Cafe (coffee theme park). A theme park dedicated and created for the coffee growers of the zone. Different thriller rides, water rides, horse riding, restaurants, telefericos and more can be enjoyed inside the park. Also, a museum showing the whole, very throughly process of the coffee. Everything is include in the price of you get the VIP pass, otherwise there are cheaper options if you only want to enjoy certain rides. A day full of fun and coffee. Last but not least, another typical coffee growers town is Salento. This small town with about 3000 inhabitants has been growing in popularity by tourists in the past few years. The twon still keeps its colonial style homes, a beautiful church and the stores and restaurants around the center full of people all of the time. It has a viewpoint with the most astonishing view of the Valle of Cocora (Cocora valley). This town is also known for its unique and famous Palma de cera (Ceroxylon) only grown in the area. The best way to visit and enjoy around is to rent a horse and go horseback riding. It’s a very local way to enjoy the nature part of the area. Salento definitely has a lot to offer and it is a no miss while visiting the coffee zone. Thanks to Myriam for such a lovely time and hospitality. How to get to Salento and Santa Rosa: Buses leave frequently all day from Armenia and Pereira. Thermal baths of Santa Rosa: Once in Santa Rosa, we had to take a mini bus or Chiva to get to the place, 20mns ride. The entrance costs 20’000 c. pesos during the week and 34’000 c. pesos during week end and holidays. Parque del Cafe: The park opens at 10 am and closes at 6 pm. We advise to spend the whole day in the park as there is a lot to see and do. The full day pass costs 58’000 colombian pesos.